A few weeks back Sharon stopped by the PR offices with a HUGE bag of buttons for me. I had totally forgotten that she had promised me an old collection if she still had it. Well, let me tell you, this bag weighs 10lbs. It's been picked through a few times for the really special stuff so what's left is a lot of really great everyday wear buttons. Perfect! I love having a bunch of buttons I'm not scared to use you know? As you can see, nothing super crazy amazing. I did find a few cool ones though. The collection should be sorted at some point to be usable, it's just a big pile as it is. No I don't own it yet but I'm on the lookout. This machine was produced from 1938 to 1941 which is a rather short run. It was the first zigzag sewing machine Bernina ever produced. Often they don't come with a motor and are meant to be mounted industrial style or treadled (see the big holes in the bed for the belt on the right). 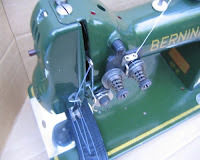 Will it sew any better than a 1960's Kenmore? No... But it's so cool looking and rare! Now I want you to notice a few things about this machine. See the tension disks? See any similarities between that and the Pfaff 138? Now you've seen this photo already but notice the shape of the Necchi BU Mira, gosh that's familiar isn't it??? Mind you both the Pfaff 138 and the Mira came well after the Bernina 117. Very interesting to me how the design carried over into other manufacturers. "just old plastic junk" - I totally get it! Wonderful to see you updating again! Hey Brian! Great to see you are back. I was worried! Funny how you can worry about someone on the other side of the world who you only know because you 'bumped' into their blog! I love you 'clue' and you'd have to be mad not to love a man that sew (and sews so well). Great to have you back. Oh my son (who is 6) loved the Secret Life of the Sewing Machine! 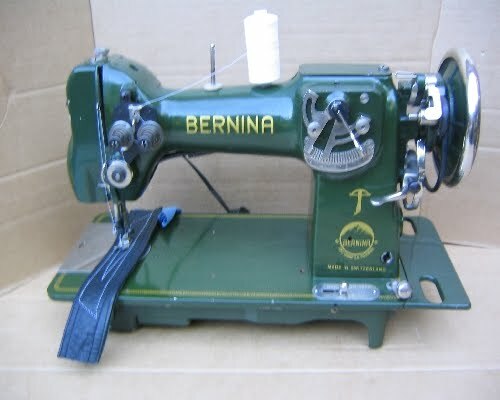 I have that Bernina! I stumbled across this blog via pinterest and was excited to read more about it. Mine is in the original cabinet and pretty good shape, we brought it back from Switzerland with us when we moved to CA. I still have the original accessories and manual in German. I had no idea it was such a rare production! I have one it's a treadle and the book is in German. Love her! I have one for sale. Many spare parts.